I have been reading many posts of late expressing concern over whether one should sell their APS-C or FF kit and then buy some other, smaller size equipment. If that is your choice, fine; but there is another, FREE, option you might first consider. My wife came up with this when she became the new "owner" of my new Canon 70-300L lens. It was somewhat heavier than the 55-250 she'd been using, so required a new carrying approach. I guess this was a natural for her as that's how she carries her heavy purse when in a crowded area. I now use this carry option as well, at least part of the time, with most lens/camera combinations. This past spring we spent a week in the 4-corners states and I (at 78) carried my 5d Mk III with my 100-400L Mk II with no neck problems. Of course you still use the neck strap (Optech) for safety and occasional hanging around the neck when changing lenses, etc. We walked a lot and I felt no discomfort at all. It appears to me that it's not how far you walk, it's how you carry the rig. Give it a try, you may extend the life span of your current gear until you're a basket case and no longer need any gear! That's my plan; actually I just bought a new (refurb) 80d, and it's no lightweight either. I was doing that for years with almost everything, not just my camera but nowadays I use a harness that goes over both shoulders and can support both a camera and a pair of binoculars at different heights so they don't bash against each other. It saves that awful rubbing on the back of my neck. but there are plenty of other systems that do a similar job. what is the "free other option"? Look at the photo again. Simply hold the camera on your forearm; that's the option which costs nothing at all, and certainly does work for me. This method is less hassle than using my cotton carrier knock-off as the camera is always ready for instant use, plus the weight is being carried on the arm's major bone structure and not on the more vulnerable neck/shoulder muscles. Aged lives matter. Okay? Sorry Hoggers, when I go back and look at my post, it appears as if the photo did not attach. I will try again and repost with the photo this time. Duh! This ain't rocket science. I learned to carry guns that way over 60 years ago when I first went hunting. Alternates are shoulder carry, if you get a rig that goes over both shoulders it works even better. Not too expensive, in fact if you have two camera straps you can make your own by attaching both to the camera and put one over each shoulder. You can even get someone to hook a small bungee cord around the two of them behind your back and then they don't slip off when you bend over. And there are the carry rigs that include a wide belt that rests on the hips with shoulder straps that split the weight three ways. The military uses that type of rig. They cost a bit more. You can put together your own with belt and harness from the surplus store. I also own a mesh vest with pockets/pouches for misc stuff and anchors for two cameras using an attachment on the tripod socket. Mine was on clearance (new model came out) for less than $30. I seldom use it any more because I now use the socket for a pistol grip. Oh, forgot, I have a belt with pouch that holds a camera and a medium size lens that has anchor points for a shoulder harness I bought back in the 70s or 80s (I forget just when.) for a film camera with medium telephoto mounted. I should dig it out and use it, it is now used to store one of my old 35 mm cameras with a fast 135 lens mounted. Yeah, I realize there are lots of solutions out there, but just thought I'd offer a possible solution to those folks who my be unnecessarily fearing problems as they age. I too use several other carry techniques for different situations: eg. Vest, Optech camera straps, heavy duty military belt with lens pouches. They all work, but this easy carry is just one more way to spare the neck, and I do know from personal experience you'd be hard pressed to carry a heavy camera/lens combo that is faster on the draw and yet less stressful on the tender neck muscles. Actually I do carry that way a lot. I often have the camera in the car when I am going anywhere near a good photo spot. But I don't like dumping all the carry gear in the car and then having to put it away when I get home. I usually have my right hand on the camera holding the battery grip with index finger on or near the shutter while my left arm is curled around the pistol grip mounted on the lens collar so the weight is on the elbow and the left forearm-hand supporting the lens/body join. Pull camera back and up while the left hand slides to the pistol grip, lift up to eye level and either look through the RedDot sight I often mount on the hotshoe or the viewfinder and I am in business. Now if I just had the reactions I had those decades ago I might actually catch some "snap shots" of BIF up close. I read through your message twice, WHAT is the solution to prevent neck pain? 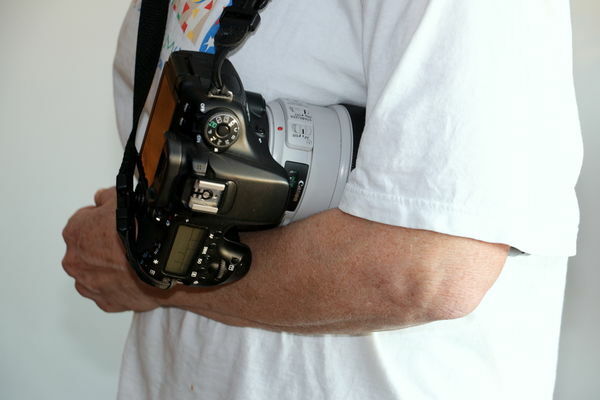 For myself, I carry my camera with the strap over my right shoulder and the camera hanging on my left side. Or I use the Op/Tech BinoHarness. ETA: Oops, should have checked further down the page. Sorry, Bruce! I usually have a hand on my camera, even though it's on my neck or shoulder. Actually, it's not hard at all to hike with the camera in the tuck position; just exactly the opposite. the heavy load is so well balanced that there is no need to even keep your left hand on the camera. and if I might stumble, as I do, the camera stays pretty much in place or just swings out on the neck-strap until I regain balance. and further, it would be unusual to walk for more than 15 minutes without either checking out a possible subject, or actually taking a picture. But like I said, when I avoid extended direct neck-strap carry, my neck pain never happens. I also use my chest harness with quick release if I choose to carry two cameras, loaded and at the ready. My chest harness is an Opteka knock off of the Cotton Carrier, and seems to be reliable while performing it's function rather well as the weight is spread evenly across both shoulders and not so much on the neck. Got it through Amazon for around $35 and it works for me. I'm trying to prolong the inevitable surgery that the deteriorated cervical vertebra will require. Doc says keep doing what you're doing as long as it works, so I will. Meaning no carrying heavy weights directly on neck muscles. I use a hand grip on the camera (5d IV with a 16 to 40 and a 7 DII 28 to 300) and carry a camera shoulder camera bag for the camera I'm not using. Been doing this for at least 15 years with no problem. PS I'm turning 85.